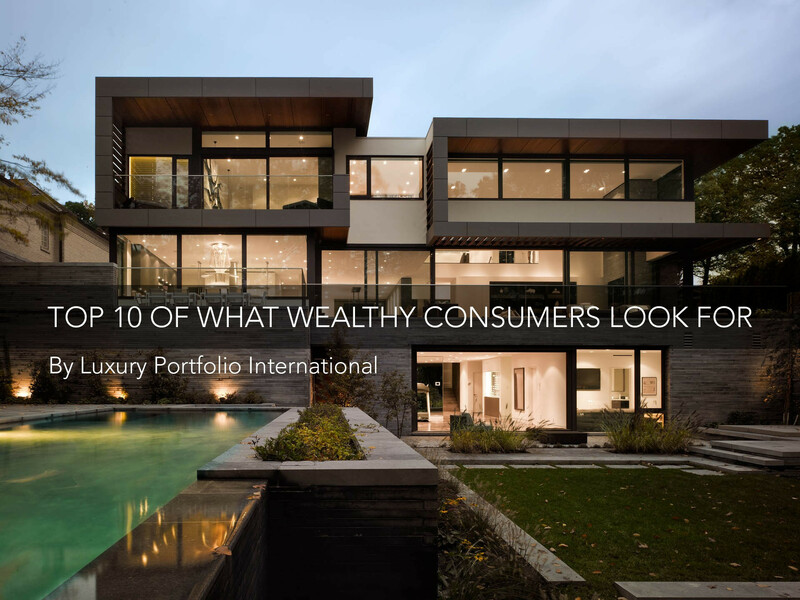 What are wealthy consumers (above $3M assets excluding primary residence) looking for in a home ? 1. Lots of privacy = 61% 2. Master bedroom with an en suite luxury bathroom = 60% 3. Energy efficiency and environmental design = 56% 4. Kitchen with high-end appliances already installed = 55% 5. Master bedroom with dual walk-in closets = 54% 6. Outdoor patio/deck designed for entertaining = 50% 7. An open floor plan throughout the house = 50% 8. Kitchen area conducive to entertaining = 45% 9. A lot of open space around the home = 45% 10. Close proximity to shopping and services = 44% Download "Real estate demand from wealthy by Luxury Portfolio International"